An ode to a stalwart in the shadow of the Peter Luger colossus. Sitting down at DeStefano’s Steakhouse, you may notice the somewhat conspicuous absence of one of those taken-for-granted staples of the chophouse experience: steak knives. I hadn’t noticed it on my first trip there, but my grandmother did. When she asked for one, John Donatelli, the co-owner and manager, smiled and said “Trust me, you won’t need it.” We’d all ordered the filet mignon and couldn’t help but laugh as our butter knives made such easy work of them. DeStefano’s exists in the shadow of the Peter Luger colossus. Luger sauce is sold in supermarkets, their steaks are available by mail order and they draw tourists from around the world to tackle their porterhouses. 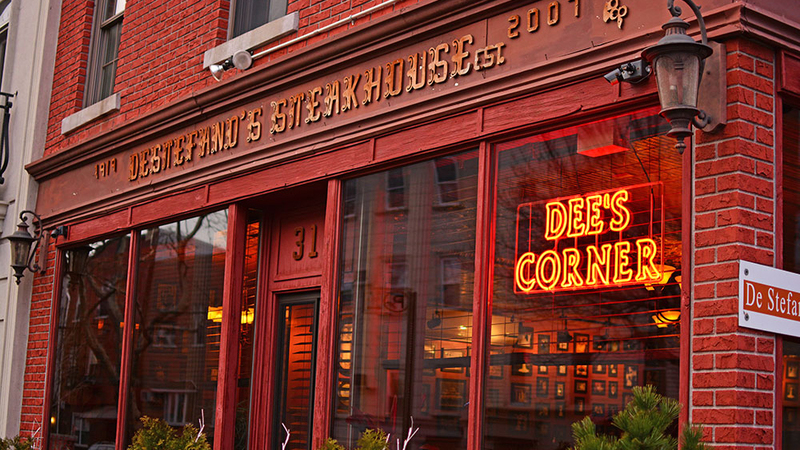 But, I’ll take the cozy dining room at DeStefano’s over the bustle of Peter Luger any day. And while a neighborhood place isn’t likely to dent Luger’s 130 years at the top of the meat heap, I still think it’s better to be the first DeStefano’s than the next Peter Luger. But that’s kind of the DeStefano’s brand—offering a classic experience that diverges just enough from convention to stand out. A lot of steakhouses serve slabs of bacon, but they rub theirs with spices and glaze it with brown sugar. Many steakhouses are big, clamorous dining halls, but at DeStefano’s it’s like you’ve been invited into someone’s home. Of course, there’s a reason for that: The building, on the corner of Conselyea and Leonard Streets in Williamsburg, Brooklyn, has been in John’s family ever since his great-grandparents immigrated from Italy and bought it in 1919. Over the decades, it’s been a pool hall, an ice cream parlor and a social club. And while its walls, adorned with black-and-white family photos and vintage movie posters, give the sense that it’s been there forever, this year will mark the restaurant’s 10th anniversary. John left a 15-year career on Wall Street when his father, Joe, opened the restaurant, neither of them having any more food experience than selling zeppolis at the neighborhood’s Our Lady of Mt. St. Carmel feast (which they still do). There was a learning curve to be sure, in which he went from just “knowing the basic cuts” to now hounding his meat supplier about steak minutiae—the ribeyes need bigger eyes, the porterhouses need more marbling. He’s even embarking on an experiment dry-aging some cuts for 90 days, with his suppliers sending him photos of the progress every two weeks. 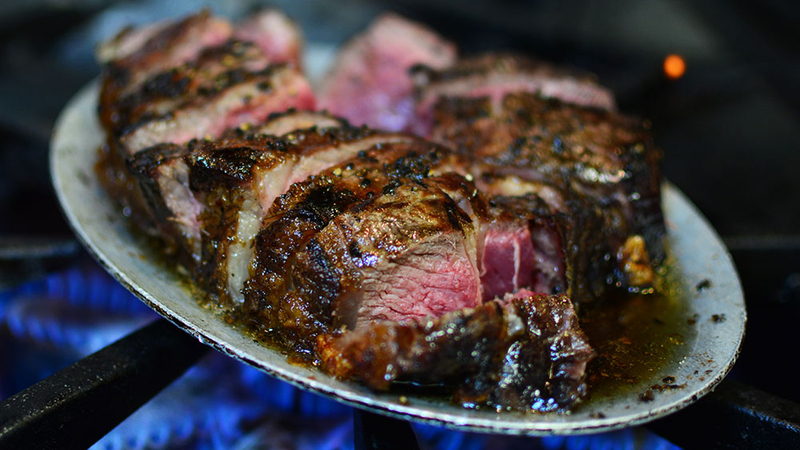 How DeStefano’s came to be a steakhouse, John says, is that his father felt like he just couldn’t get a good filet mignon in the neighborhood. No matter the time, day or month, every filet they’ve ever served me has been cooked to the same degree of medium-rare perfection, with a crispy crust of seasoning encapsulating a center so tender that even my wife, who gave up meat over a year ago, will make an exception for it. That’s not to mention the sides, like my personal favorite, the creamed corn—rich and cheesy and exactly the kind of thing I’d want to eat when I’m under the weather. One of the twin pillars of DeStefano’s is consistency. All the food is prepared by the same two chefs—brothers—one of whom has been cooking in that kitchen since the day it opened. Maintaining that consistency dictates their plans for the future. They might open the rooftop, or expand the dining room into other parts of the building, but John says they aren’t looking for mass expansion. Better to operate one place well than overextend at the expense of their reputation.